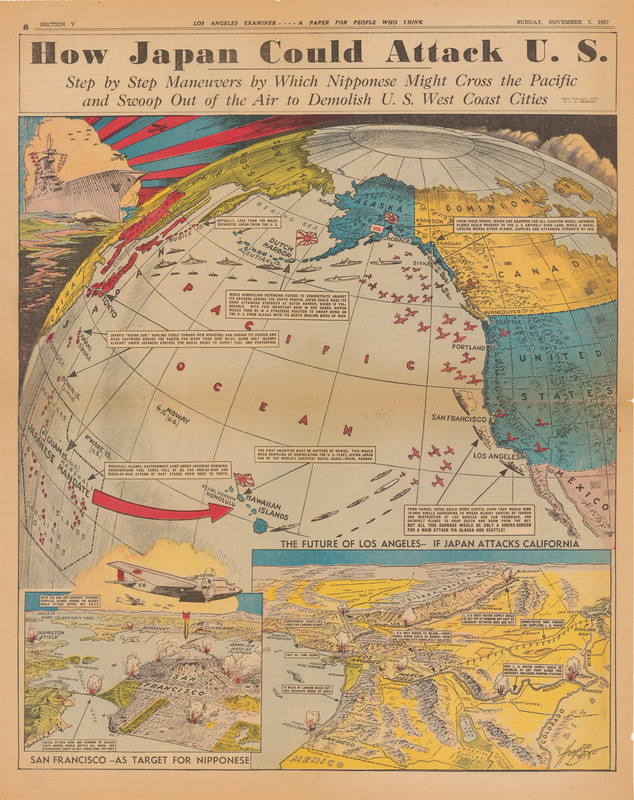 How Japan Could Attack U.S.
An eerily prescient 1937 map of a Japanese attack on the U.S., highlighting the significance of Pearl Harbor: "The first objective must be capture of Hawaii This would mean crippling or annihilating the U.S. fleet." Japanese planes and ships cover the Pacific, and insets show the bombing of Los Angeles and San Francisco. Howard Burke was an artist for the Los Angeles Examiner who frequently used the new "air-age" projections of Richard Edes Harrison (see Schulten 2001, 214-228), along with strong pictorial images like those here (Cosgrove 2005, 46-50). It's not a coincidence that this map appeared in the Los Angeles Examiner, part of the chain owned by William Randolph Hearst. In 1906, "the Hearst press began what would be a thirty-five year war with Japan." Daniels 1962, 70. Hearst didn't coin the phrase "yellow peril," but he used it early, often and forcefully, beginning with a 1907 article proclaiming, "The Yellow Peril is here." Ibid. 71. Hearst continued to attack the "yellow peril" during World War I (when Japan was aligned with the allies against Germany) and after the war, not only through his newspapers, but in a motion picture, Ibid. 74-76, 89-90. When he did it again in 1933, Time Magazine noted that "The Yellow Peril has for 30 years been a great circulation-getter for the Hearst papers." Time, September 11, 1933. Interestingly, Hearst had a very different view of Mussolini's imperialist objectives at about the same time. See Notes for ID #1287 Howard Burke, "What Italy Wants." Los Angeles Examiner, November 7, 1937, p. V-8.